New York - New York City will conduct regular safety checks of its properties under elevated rail tracks after a fire disrupted commuter rail service at Grand Central Terminal for days last week, Mayor Bill de Blasio said on Thursday. The city will review all such city-owned or managed properties, and amend its lease with the East Harlem garden supply store that burst into flames on May 17 after an accidental gasoline spill, he said in a statement. “We are ramping up inspections in the affected area and reviewing sites under critical infrastructure citywide to ensure New Yorkers’ safety and peace of mind,” de Blasio said. Urban Garden Center, the store which occupies city-owned property underneath elevated Metro North railroad tracks, has been issued four summons requiring a court appearance, the mayor’s office said. The city has accused the store of illegal storage and use of flammable materials. The new lease, which Urban Garden Center was reviewing, makes clear that city and Metropolitan Transportation Authority officials would be allowed to enter the store at any time to conduct inspections or repairs, the mayor said. The storage of flammable gas and liquids will be prohibited and fire officials will continue inspecting the store at least once a month, he added. Thomas Prendergast, chairman of the Metropolitan Transportation Authority, which runs Metro North, last week demanded an investigation into whether flammable materials should be stored under rail tracks. On Monday, Metro-North President Joseph Giulietti told MTA board members that permanent repairs to the site were under review. 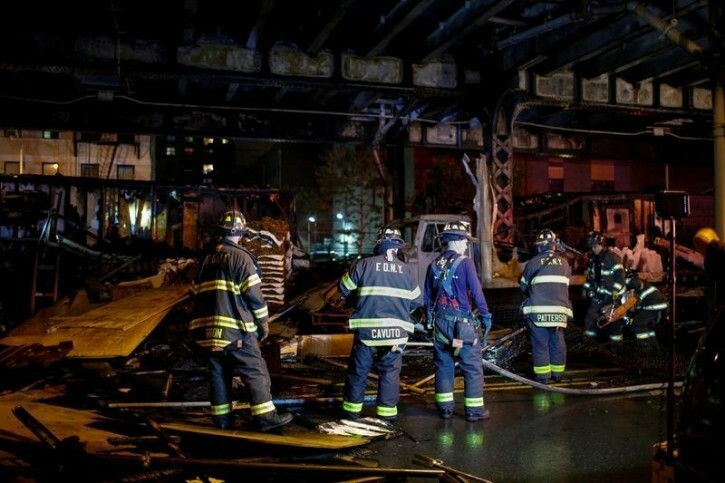 The New York City Fire Department found that the four-alarm fire started when gasoline accidentally spilled onto a hot generator, igniting surrounding debris including wooden fencing. For three days while the damaged tracks were being repaired, trains headed to and from Grand Central Terminal were forced to slow down and operate on a limited schedule, affecting tens of thousands of Metro-North Railroad passengers.